I will start off by saying you probably need to have read at least the first book in this series to understand what is going on, or maybe more of who the Gray Man is. Agent in Place is book 7 in the Gray Man series. Amazon affiliate links are used on this site. A free audiobook was provided by Audible for an honest review. Agent in Place has everything I enjoy in a great spy-type thriller. I'm not sure if it was listening to it on audio or because I hadn't read any other books in the series, but I felt kind of lost in the story. 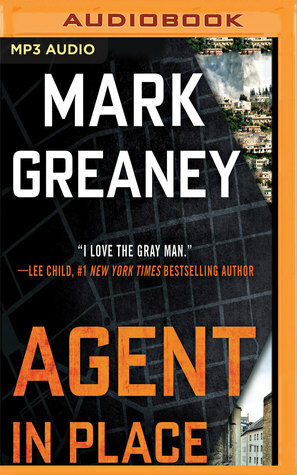 Mark Greaney is now writing one of my all-time favorite espionage series - Tom Clancy's Jack Ryan series. I have continued to enjoy that series after he has taken over. So I was interested to read Greaney's own series. I was a little worried about jumping in at book 7, but often these type of books can be read more or less on their own. The plot is kind of intricate with Cort being undercover, perhaps with more than one group. I think that was my main point of confusion. I couldn't figure out who he was working for and who the good guys and bad guys were. Perhaps if I had more of an understanding of the players of the Syrian conflict then the plot may have also been clearer. So I had trouble keeping everyone straight. In that respect, it might have been better to have read the physical book, rather than listen to it on audio. I might try listening to it again just to see if I pick up on details that maybe I missed in the first go around that would make things clearer. I liked the narrator Jay Snyder. Maybe he just has one of those voices, but he sounded familiar. I don't think I've listened to any audiobook read by him before though. He did a great job and his voice was just what I would imagine a character like Cort. I'm not sure if Greaney was already working on the Gray Man series when he teamed up with Tom Clancy, but I definitely see why Clancy chose him (or whoever chose Greaney) to continue the series. The writing style and tone are very similar. I'm sure anyone who enjoys the Jack Ryan series would also like the Gray Man series. I want to go back and pick up the first book in the series because I really think it is a series I would enjoy. Buy Agent in Place at Amazon or get it free with your free trial of Audible. This sounds good. Thanks for the tip about listening to book one first. Much appreciated. It was really good. I just kept getting a little lost. I'm going to see if my library as the first book in the series as I really think getting a foundation understanding of who the Gray Man is will help sort everything out.